“Love sure is a funny thing,” muses Jim Carrey at the start of I Love You Phillip Morris, but you wouldn’t know it from the evidence offered by this mirthless, aggressively tasteless dramedy. Clumsily toeing the line between adolescent humor and heart-tugging melodrama, this debut feature from screenwriters Glenn Ficarra and John Requa is a tonal mishmash that never manages to set itself straight. 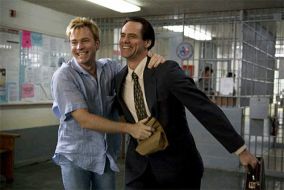 Covering a span of several years, the movie looks at the crime career of two gay criminals, played by Jim Carrey and Ewan McGregor, who work out their trust issues while living lies built on lies. I Love You Phillip Morris attempts a balancing act that it almost immediately drops. Arch and campy, yet yearning to work as a love story, the movie leaps awkwardly between pathos and potty humor. Unsettling every element is Carrey’s typically manic performance. As in any of his so-called serious roles, his inability to tone his mugging down defines the tone of his surroundings. The Truman Show, for example, featured what could be termed a low-key Carrey performance, but it was still broad by any sane actor’s standards. The same critique applies here. Carrey, usually speaking with an absurd and inconsistent accent, is as rubber-faced as ever, infusing every single moment he’s on screen with comic timing, lest some humanity shine through. Carrey’s attention-seeking performance makes it clear that this is a vanity project, through and through. That it is centered around the still-present taboo of A-list actors playing gay is almost irrelevant. While that fact does make the lead actors “brave” in some twisted sense of the word, the presence of these stars becomes distracting in these roles, at least when handled in a manner that aggressively begs the audience to disbelieve what they are seeing. I Love You Phillip Morris’ off-color attitude oscillates between offering rude and offensive humor, turning both crime and homosexuality into fodder for its supposed jokes. The other elements barely contribute. McGregor plays an effeminate, sweet character, but after coming on strong in a courtship, the rest of the script leaves him waiting on the sidelines. Leslie Mann is hideous, as usual. Not since Tea Leoni’s turn in Spanglish has there been a less appealing housewife on movie screens. She does, however, get to momentarily serve as the moral center of the film in a brief scene in which she asks whether or not there is an equation with being gay and stealing. While that theme is vaguely offensive, there’s no doubt that I Love You Phillip Morris explicitly equates deception with the life of a closeted gay. The film’s defense seems to be that it is rooted in a true story, but there have been so many liberties taken with the truth here that any resemblance to reality is coincidental. I Love You Phillip Morris certainly has no obligation to present its gay characters in a positive light, but audiences expect characters, regardless of sexual orientation, to be interesting, and that’s where the movie is a letdown. Defined by puppy love, a crude sense of humor, and rampant immorality, the characters here are as repulsive and shallow as the film that contains them. Ficarra and Requa are weak directors, who try to coast by on shock effects and manipulation. The filmmakers use musical montages so frequently that they reduce both the cons and the courtship alike to meaninglessness. By the end of the incredibly crude I Love You Phillip Morris, they have demonstrated only their own malignancy.